The more experienced we are, the more we grow to understand that the questions we ask or the answers we give in an interview say a lot about our enthusiasm and level of interest for a product, company, or organization. This is definitely the case with Salesforce, the mightiest Customer Relationship Management (CRM) service in the world. Salesforce is the most effective Customer Relationship Management (CRM) product that is delivered to subscribers as cost effective software-as-a-service (SaaS). 2. What is a custom object in Salesforce? In Salesforce, custom objects refer specifically to database tables that store data related to your company in Salesforce.com. 3. What does a custom object permit the user to do? Once the custom object is defined, the subscriber can perform the following tasks: create custom fields, relate the custom object to other records, track events and tasks, build page layouts, create a custom tab for the custom object, analyze custom object data, create dashboards and reports, and share custom tabs, custom apps, custom objects, and various other related components. None of these tasks can be accomplished until the custom object has definition. 4. What is a Self-Relationship? A Self-Relationship is a lookup relationship to the same object. It is this premise that allows users to take the object “Merchandise” and create relationships with other objects. 5. What is the Object Relationship Overview? In Salesforce, the object relationship overview links custom object records to standard object records in a related list. This is helpful to track product defects in related customer cases. Salesforce allows users to define different types of relationships by creating custom relationship fields on an object. 6. What can cause data loss in Salesforce? 7. How is SaaS beneficial to Salesforce? SaaS is subscription-based, so clients can choose not to renew and discontinue using the program at any time without penalty other than not being able to use Salesforce. SaaS is intended to help users avoid heavy initial startup fees and investments. SaaS applications use a simple Internet interface supported by easy integration. 8. How does Salesforce track sales? Most importantly, Salesforce tracks and reports repeat customer activity, which is the key to any sales organization. 9. How many types of relationships are offered by Salesforce.com? Salesforce recognizes two relationship types: Master-detail relationships and Lookup relationships. 10. What is the trigger? Trigger is the code that is executed before or after the record is updated or inserted. 11. What is the difference between Trigger and Workflow? Workflow is an automated process that fires an action based upon evaluation criteria and rule criteria. As described above, Trigger is the code that is executed on or after the record is updated or inserted. 12. What is static resource in Salesforce? 13. What is the difference between Force.com and Salesforce.com? Force.com is Platform-as-a-Service (PaaS), while Salesforce.com is Software-as-a-Service (SaaS). 14. Is there a limit for data.com records? Salesforce users can see their limit form setup easily by simply clicking data.com administration/Users. From the data.com users section, the users can see their monthly limit and exactly how many records are exported during the month. 15. What are the three types of object relations in Salesforce? The relation types are quite logical once the user becomes familiar with the software program. 16. What are the different types of reports available in Salesforce? Summary reports that are detailed reports in which the grouping is based on columns. 17. Is it possible to schedule a dynamic dashboard in Salesforce? In Salesforce, it is not possible to schedule a dynamic dashboard. 18. What is the junction object and what purpose does it serve? 19. What is an Audit Trail? The Audit Trail function in Salesforce is useful for gaining information or for tracking all the recent setup changes that the administration has done in the organization. The audit trail can preserve data for up to six months. 20. Explain the Salesforce dashboard? In Salesforce, the dashboard is a pictorial representation of the report. 20 reports can be added to a single dashboard. 21. What is the difference between SOQL and SOSL? SOQL is Salesforce Object Query Language and SOSL is Salesforce Object Search Language. If you are sensing that Salesforce is a culture unto itself, you are correct! 22. What is a Wrapper Class? A Wrapper Class is a class whose instances are a collection of other objects and is used to display different objects on a Visualforce page in the same table. 23. What is the sharing rule? The sharing rules are applied when a user wishes to allow access to other users. Salesforce has become the centerpiece of many company’s sales and marketing automation efforts, and the demand for qualified Salesforce administrators is as high as ever. Nonetheless, competition is also tough for the right positions, so preparation is key if you want to stand out from the crowd. These 23 most common questions and answers will help you prepare effectively and perform well in Salesforce interviews. Study them thoroughly to make a good impression on your prospective employers. Do any of the above topics stand out as weak knowledge areas? We offer four different training courses to get you up to speed in a snap. 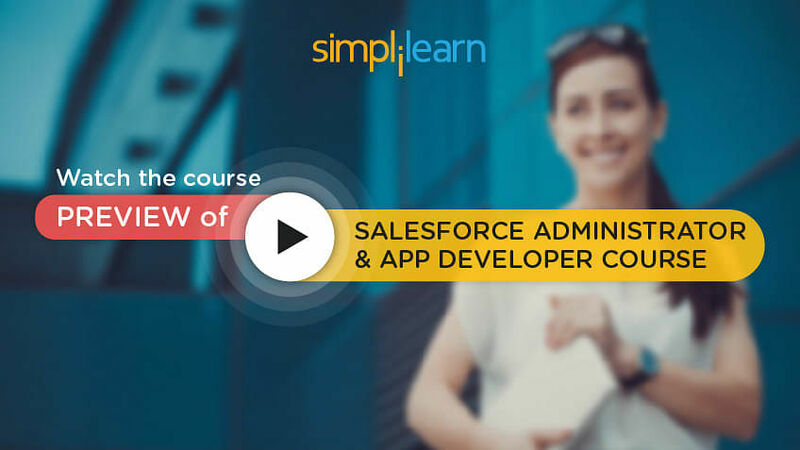 Looking for Salesforce App Builder Certification? Here're 60 Salesforce App certification exam questions. Take this free practice test to know where you stand! Ryan Scalf is a professional Salesforce Consultant specializing in the Sales Cloud and user adoption. Ryan holds the 4 following Certifications: certified Admin, Developer, App Builder and Advanced Admin and has trained 2000+ individuals on Salesforce Administration and Development.